Azure security and compliance are crucial for enterprises of any size that rely on cloud computing to handle their business processes and customer data. The biggest challenge is ensuring that Azure supports their network security requirements and enables them to adhere to regulatory and industry best practices regarding Azure privacy and data protection. Preparing all the necessary compliance information into usable reports can take days, because finding and extracting the exact data you need from the audit trail is not an easy task. It’s hard to predict what questions an auditor would ask, so you have to be ready to find specific information that is requested in minutes. It’s always a headache to figure out where to store your audit trail and securely protect it, while still being able to review events from the past when an auditor knocks at your door. You need to quickly spot and chase down suspicious Azure AD activity in order to minimize the risk of identity theft, unauthorized access to critical resources and other threats. Slash compliance preparation time by 50% with predefined reports, including pre-built compliance reports mapped to the most common regulatory standards, such as CJIS, FERPA, FISMA/NIST, GDPR, GLBA, HIPAA, ISO/IEC 27001, PCI DSS and SOX. Spot insider and outsider threats faster by subscribing yourself or security officers to the reports that each of you needs most and having them delivered automatically on the schedule you specify. Expedite investigations by drilling down into the audit data in minutes to get to the root cause of abnormal activity with the Google-like interactive search. Gain a good night sleep by configuring custom alerts on critical activity across your Azure AD environment. 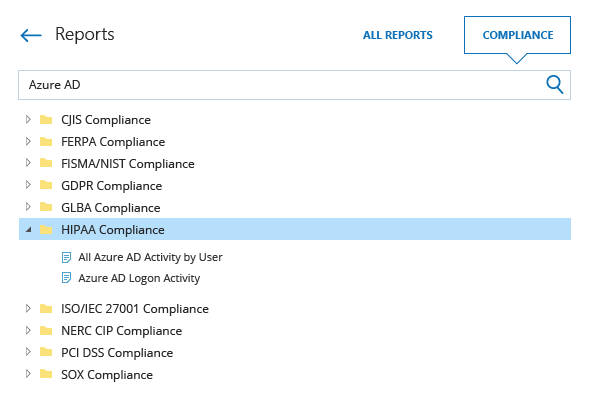 Keep your consolidated Azure AD logs securely for years in the cost-effective two-tiered storage (SQL database + file-based) and access them any time an auditor knocks at your door.